Acorn Hill Academy: Merry Christmas to Me! One thing I love about my sister, is that she doesn't mind when Christmas gifts are a little late. That's a good thing, because I still haven't sent anything to her family. I have some knitting projects that I'm frantically working to finish. Hopefully they will all be done for the twins' birthday in another week or so. Anyhoo, my gift was the only one that wasn't shipped from Amazon. My sister mailed it after Christmas. It arrived this week, and I was so excited! One of my "love languages" is gifts, so I'm fine with presents whenever they might arrive. She sent me some lovely Christmas ornaments, a nifty little clock, and some KISS Pez dispensers. That last item is a little strange, I admit, but I used to be a huge KISS fan before I learned better. My brother-in-law found those for me. It was pretty funny to open that box. My favorite is one that my mother-in-law gave me. She's decorated with wood burning and gold, which makes her unique among my little collection. 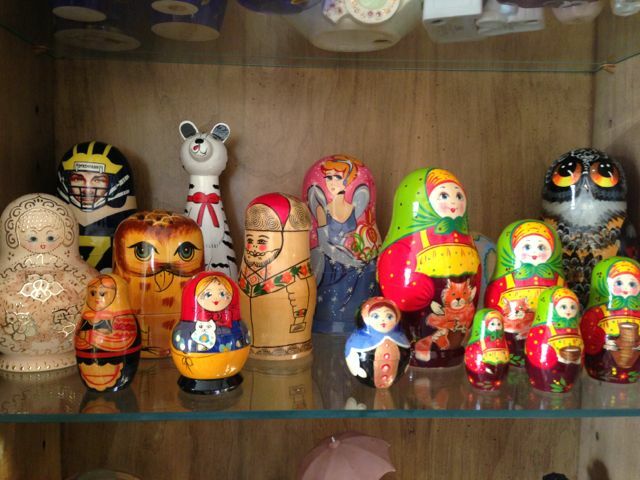 She has 10 dolls, and the largest stands about 5 inches tall. The smallest doll is about the size of a chick pea. The girls named the tiny one "the teeny-teeny." And here is the smallest owl, standing next to the "teeny-teeny." 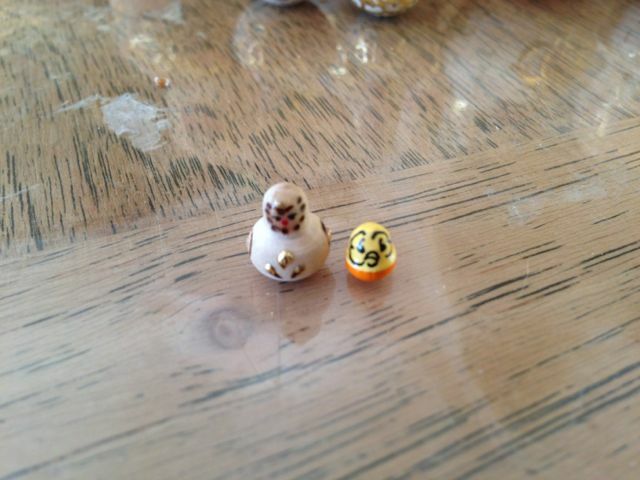 I was amazed by this tiny doll! It even has a face. 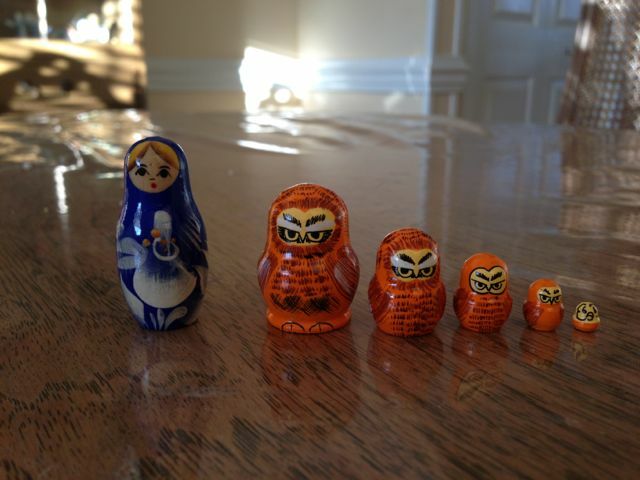 In addition to matryoshkas, I also love tiny things. Do you know what I mean? I have a miniature tea set that was a gift from my aunt when I was a child, and the tea cups are about 1/4" tall. I don't know how I still have all the pieces, but I do, and I love it. See? Tiny things. 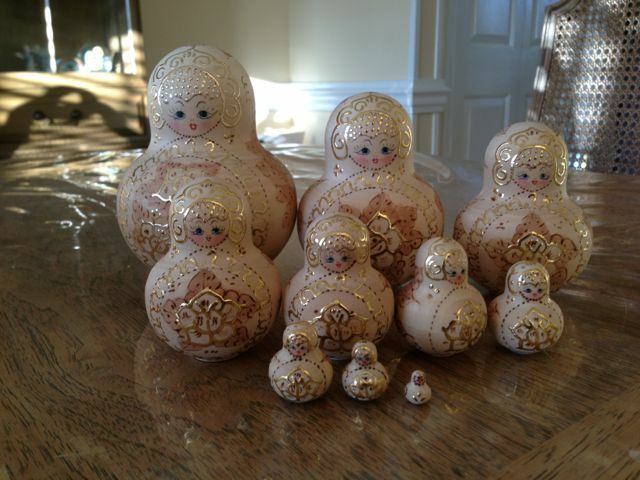 My girls loved to play with the nesting dolls when they were little. They got some of them out yesterday when I was taking these pictures, because Isaac wanted to play with the little owl dolls, and I wouldn't let him. Emma, who is 12, said, "These are our childhood toys, in my opinion." I giggled. They did love them, but they might have a few other toys around the house. It made my heart smile to see how happy they were to see the dolls, though. 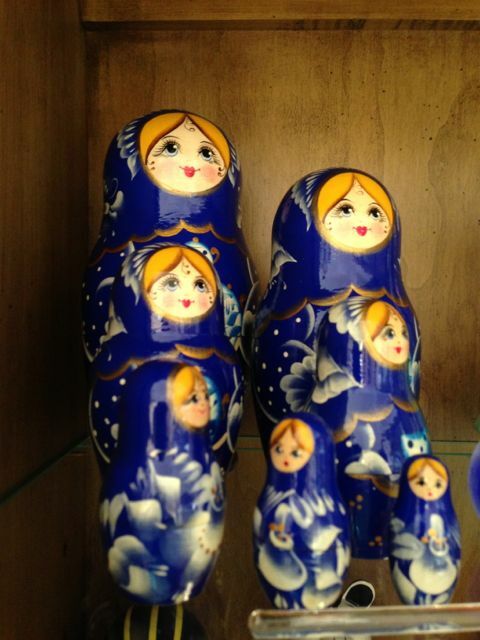 And, lest I end this post on a completely self-indulgent note, there are some lovely picture books about matryoshkas. 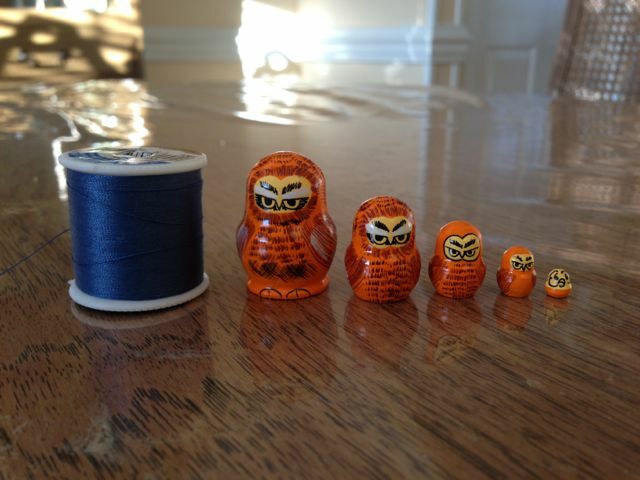 One is called The Littlest Matryoshka, by Corinne Demas Bliss. It tells the story of the smallest doll in a set, who is swept off the table and has many adventures before she finds her way back to her sisters. Another is The Magic Nesting Doll by Jacqueline K. Ogburn, written in the style of a fairy tale with strikingly beautiful pictures. Both books include a bit of history about nesting dolls, in case you'd like to earn more. And, just for fun, click here to go to a page with printable nesting dolls you (or your child) can color. Enjoy!